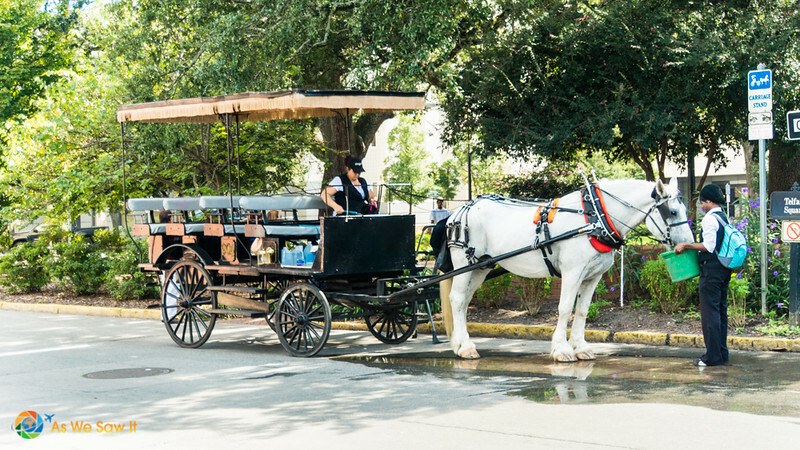 After you gawk at stunning centuries-old architecture and walk through town squares beneath Spanish moss-laden trees, spend the rest of your day in historic Savannah a different way. 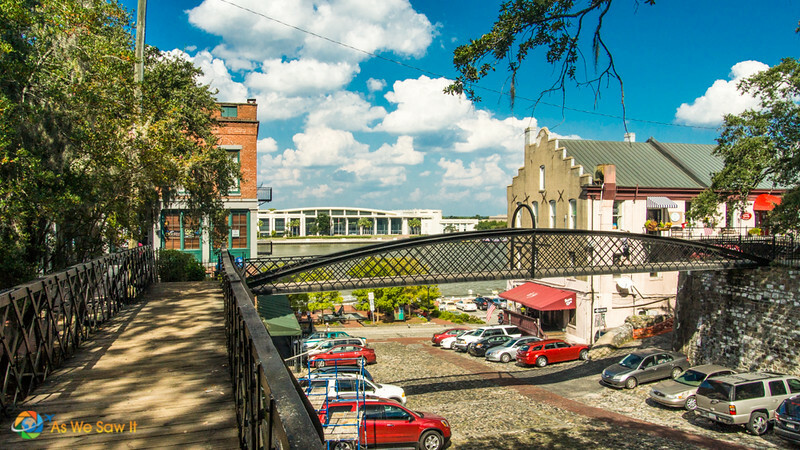 Starting with a particular street that runs along the Savannah River and a dramatic cemetery that has become a major tourist attraction. Sitting in Reynolds Square and looking at the map we decided to take a break from Savannah square-seeing. Instead, we ambled over to Bay Street (not far, only a long block away). 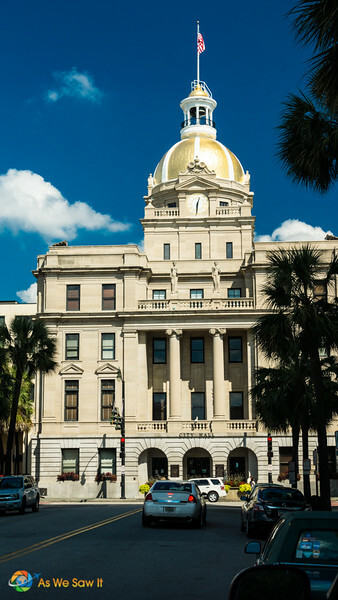 Across the intersection was the hundred-year-old City Hall, its pretty gilt dome glittering in the noonday sun. It wasn't City Hall that interested us, though. 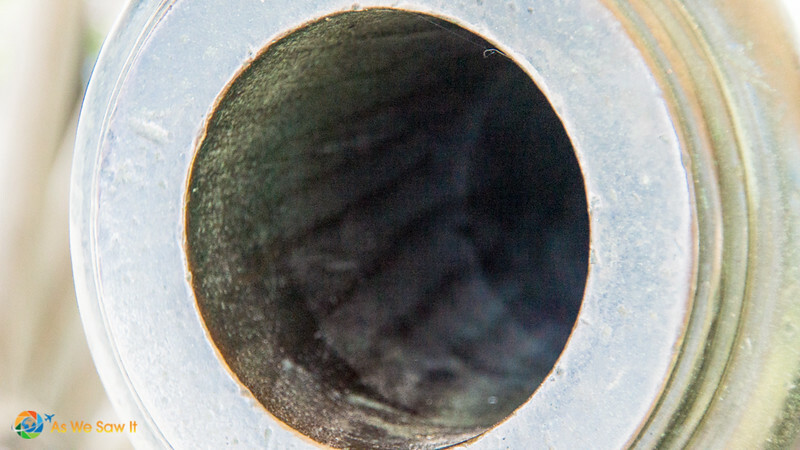 Our goal was a close-up look at the historic Washington Guns. Sitting peacefully under an unassuming canopy near City Hall are two relatively nondescript “guns” (cannons?) 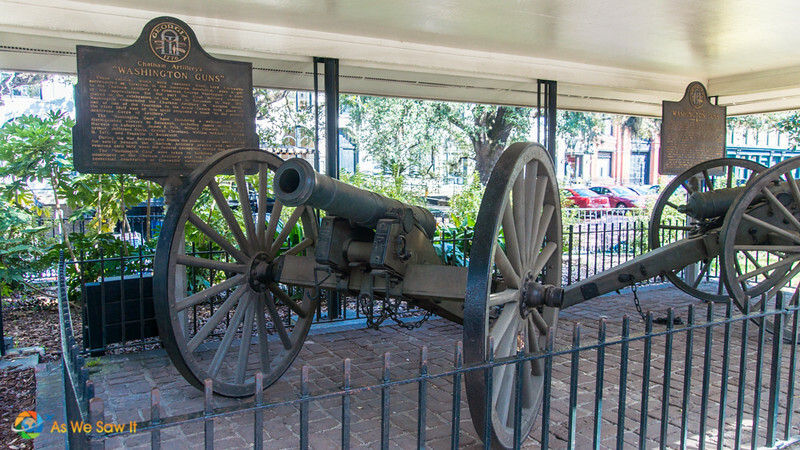 that are fondly referred to as “George and Martha.” Tour guides will tell you that they were captured from the British during the American Revolutionary War and that they were a gift to the Chatham Artillery from George Washington when he visited in 1791. Is this one George, or Martha? Oh, really? Then someone needs to explain why one of the cannons has lands and grooves in its barrel. How did that happen? That type of rifling wasn’t used in cannons until the Civil War! If you know what's up with that, please share it with the rest of us. Somebody’s got some ’splainin’ to do. Once our heads had stopped shaking in disbelief, we continued past the Exchange Fire Bell, the old-fashioned way they used to alert citizens of fire. Nearby was the building that housed the old Cotton Exchange, the site where the world's price of cotton was set every day. The fountain in front of it boasts a really nice-looking griffin in the center, a mythical beast that was said to guard ancient treasure. 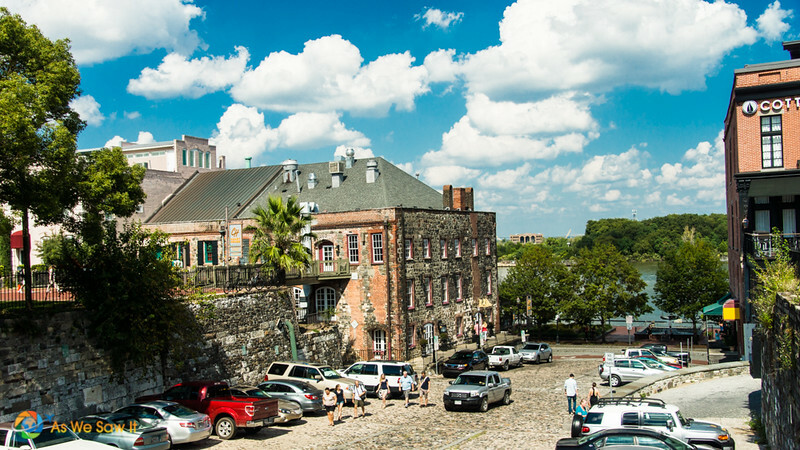 The Cotton Exchange is not far from my favorite part of Savannah, Factors Row and Factors Walk, both of which sit atop a bluff along the Savannah River. Factors Row is a unique collection of huge red brick buildings, two or three stories tall, that were used in the cotton trade back in the day. The top floors contained the cotton brokers’ offices and the buildings on the lower River Street side were used as warehouses. A series of iron and concrete walkways, known as Factors Walk, connected the buildings to the bluff. 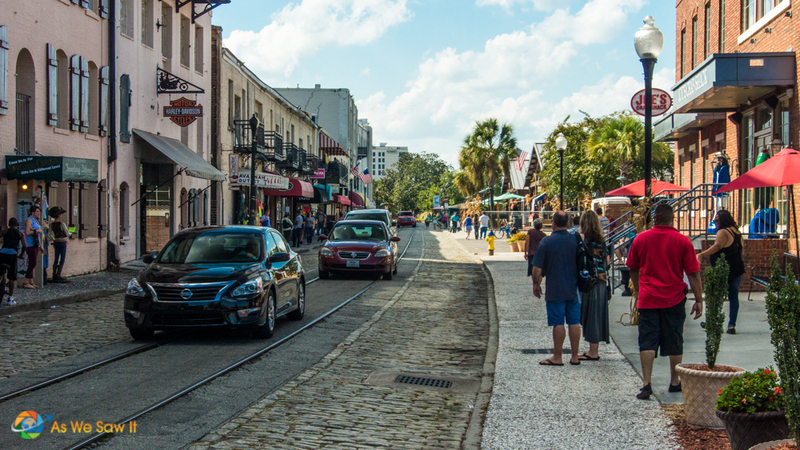 Look down between Bay Street and the Factors Walk and you'll see a cobbled street leading down to the river. Both the street and the ramps leading down to it from Bay Street are paved with cobblestones, brought from overseas as ballast and abandoned on the riverbanks by departing sailing ships. What I love most about these picturesque iron walkways is their history: The Cotton Factors would stand on these bridges and bid on the wagon loads as wagons full of cotton passed underneath. Factors Walk: Look carefully and you'll see the lower street, too. These days these historic buildings are occupied by pricey antique shops, historic inns and exclusive offices. Anywhere you go in town you can expect to find a lot of shellfish and pork on the menu. Welcome to the coastal South. Both are very popular here, to the point that some places don't offer much else. Pity the vegetarians. This is one place where it pays to inspect the menu before you decide to sit down. Mrs. Wilkes' Dining Room (107 W. Jones St.) began as a boardinghouse in 1943 and now serves its food family style. Eating here means lining up outside, then sharing a table-for-ten with other hungry visitors. There is no menu per se so it's hit-or-miss as to whether you'll like what's being served. Just like at home, they bring out the food in big dishes and soon your table will be crowded with traditional Southern specialties like fried chicken, cornbread dressing, sweet potato souffle, black-eyed peas, okra gumbo, corn muffins and biscuits. We didn't eat at either one because we were on a very strict diet regimen. Playing it safe, we chose a place with a familiar menu: Outback Steakhouse. We found one on Bay Street and enjoyed a small sirloin steak cooked Pittsburgh style. Given how disappointed I was by not being able to enjoy Colonial dining atmosphere at the Olde Pink House, that was a pretty good alternative. My nicely charred steak hit the spot. If you are watching your pennies or saving room for dinner, Five Guys Burgers (on Bay Street near Ellis Square) is a good option. Both their burgers and their hot dogs (Hebrew National brand) are prepared to order, and you can even get them served without a bun. But if you're counting calories beware: One order of their fresh-cut French fries is enough for two people. If you want to eat at The Lady and Sons but forgot to make reservations, take the Paula Deen trolley tour. It includes VIP seating at the restaurant. Lunch had refreshed us and we were ready to tackle the rest of the city, so off we went to Ellis Square. It marks one end of an area known as City Market. This has been an area for public marketing since 1755. The beautiful market building once located here was demolished in the 1950s so that they could build a parking garage on the site. After years of complaints about its ugliness Savannah finally demolished it. The space is now a public square ABOVE an underground parking garage. The new public square features a bronze statue of songwriter-lyricist Johnny Mercer (“Moon River,” “Days of Wine and Roses”), and fittingly, open spaces for public concerts. There's also a small tourist office, which was staffed when we were there. 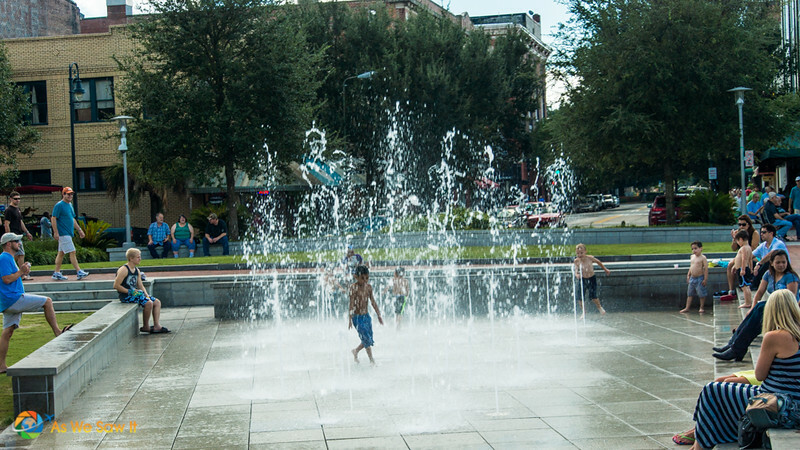 In good weather you’ll often find children romping and playing in an area where water spurts from the ground in patterns. The fountain was still running, as were the kids, when we were there on a warm mid-October day. 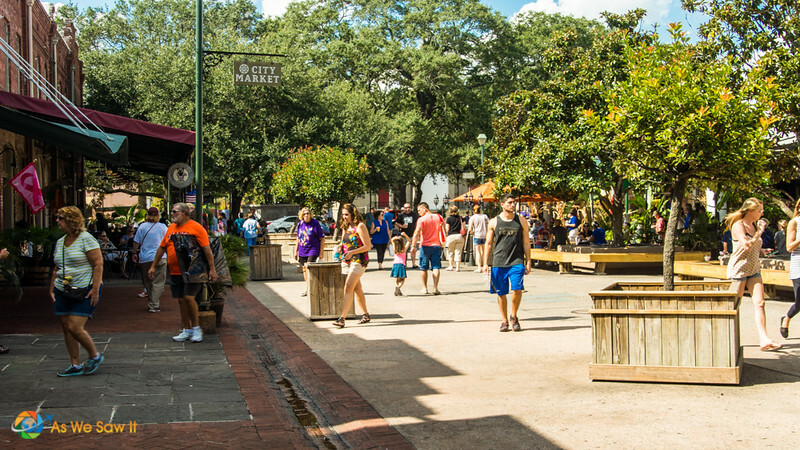 Between Ellis and Franklin Squares is a pedestrian shopping area known as City Market. Expect live music, boutiques, art galleries, sweet shops, bars and restaurants to vie for your attention. This is also a good place to arrange for a bicycle taxi or horse-drawn carriage tour. Franklin Square was named for Benjamin Franklin, who had died the year before. In the middle of the square is a statue honoring the many Haitian soldiers who fought for America’s independence in the Revolutionary War. That Haitians had defended the Colonies was a surprise to me. 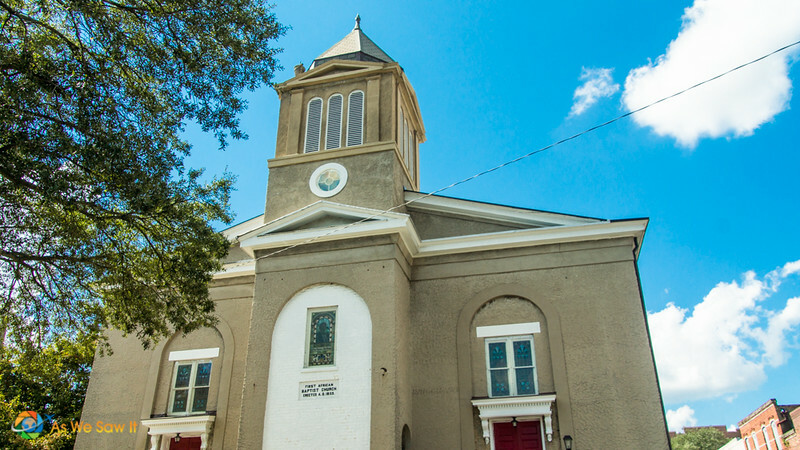 Overlooking the square is First African Baptist Church, a still vibrant church that is the oldest African American congregation in the U.S. Much of the building’s features are original. Beneath the lower auditorium floor is another finished subfloor which is known as the “Underground Railroad.”. There is a 4-foot space between both floors where slaves would hide out before their flight north. The church has a museum and tours are also available; check their website for times. By this time we had worked up a good thirst from all our walking and the waterfront along River Street began to beckon us. 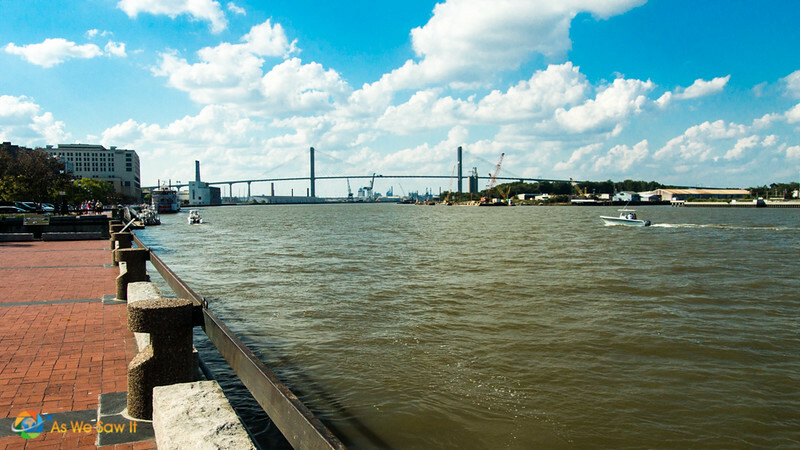 What could be better than to enjoy the breezes along the water and a bit of refreshment as we rested our feet and watch the boats tooling along on Savannah River? 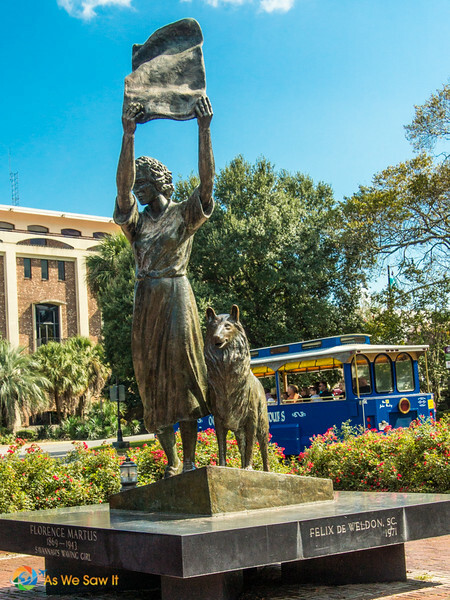 I’m very disappointed actually, because Telfair Square contains tributes to the Girl Scouts of the USA, founded here in Savannah by Juliette Gordon Low. I have fond memories of my times as a Girl Scout, from Brownie to Senior. 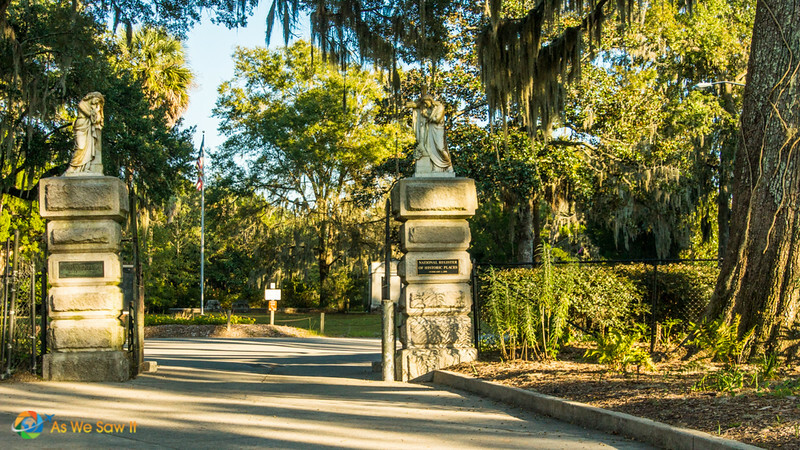 Telfair Square was one of the most fashionable neighborhoods in early Savannah and it is the only square honoring a family rather than an individual. One of the original mansions on the square was owned by Mary Telfair. 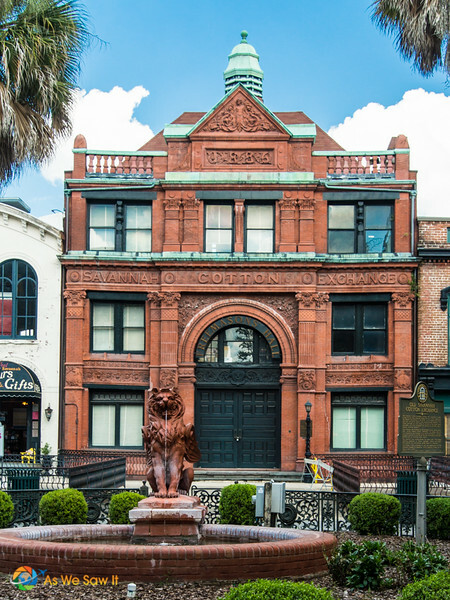 She deeded it to the city in her will and it opened as Telfair Museum of Arts and Sciences in 1886. I hope her kids weren't too upset when the will was read. follow the narrow street to the end? It was a great idea in theory, but we quickly realized we'd have to pay attention to where we put our feet. The cobbles aren't smooth and it would be so easy to take a nasty tumble! As we approached the end a trolley passed in front of us heading down to the water. We followed its path to a park where a statue of a woman waved to passing ships. 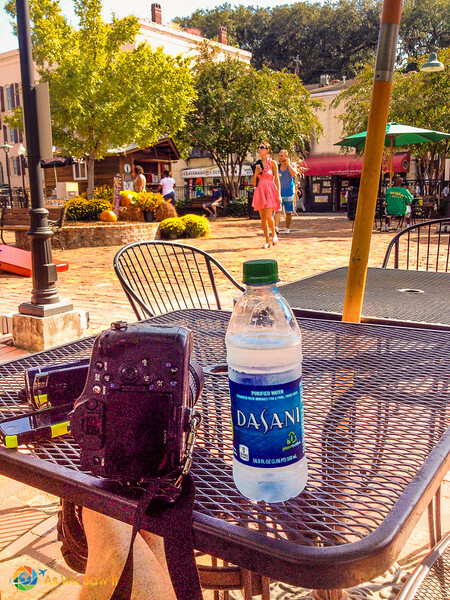 Now felt like a good time to give our feet a break with a $2 bottle of Dasani at a table along the river. The blazing sun couldn't reach us as we sat under an umbrella and a cooling breeze wafted over us from the river. We watched the passersby and marveled at the variety of trinkets for sale in a nearby shop. Why buy all that stuff? Likely all made in China, I thought, cynically. Same worthless dust collectors as every other touristy place, just with a different city\s name stamped on the t-shirts. Okay, so I was partially wrong, I had to admit as we walked in a few minutes later. As sure as they had a lot of knick-knacks, the market had just as many craft stalls staffed by local artisans. One woman had some gorgeous silver earrings I almost succumbed to but, unfortunately in retrospect, didn't. 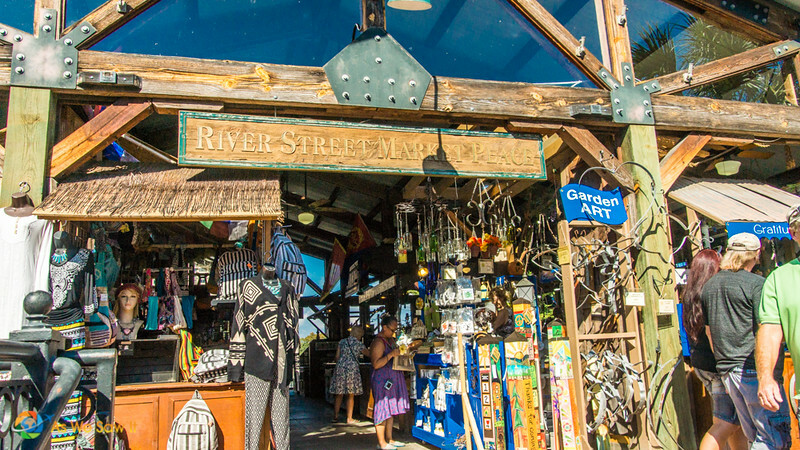 With the variety of unique nightspots, elegant inns and hotels, quaint brew pubs and fabulous restaurants I would imagine that River Street glitters after dark. By day, though, it's the century-old cotton warehouses that tempt visitors to their antique shops, jewelry boutiques and galleries. Actually there is something for everyone along the cobbled street, including those made-in-China souvenirs. And of course there is food galore to be had, from grilled fish to cappuccinos to ice cream to hand-made pecan pralines. Tell you what, I'd have liked to visit the honey tasting room we passed beneath the Hyatt Hotel. If it hadn't been for our diet…. If the tang of the ocean in the air gets too tempting you can board a boat for a daytime tour from the water or a sunset cruise. I guess you could do that if you're only in Savannah for a day, but it wouldn't be the best way to see the city. Sigh. Time to leave the river. Here it was, mid-afternoon, and we'd only seen half of the historic district. We hadn't seen Forsyth Park or the eight squares on the other side of Liberty Street, and yet we didn't think we could manage a whole ‘nother walking tour. Nope, our feet were loudly complaining that they had had enough. So we found a way to finish our tour the energy-efficient way. 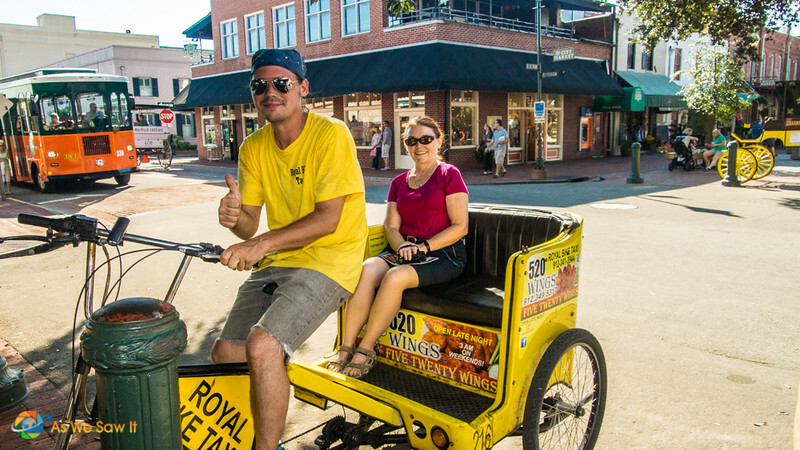 Always eager for new experiences, we hired a pedicab at City Market. As soon as we learned that he could charge for a set amount of time we asked him to give us a half-hour tour so we could see the few squares we had missed that morning without making our feet complain. I told him he could take any route he wanted, but please make it a point to go around Lafayette Square and pass the fountain in Forsyth Park. Tip: It really pays to check multiple resources before you start a trip. Although we'd also visited the Visitor Center, gotten good advice from Savannahns and viewed YouTube videos, in this case we discovered that fountain by clicking “Images” in Google's search results. Andrew Low House, built by Juliette Gordon Low's father-in-law, was where she spent most of her life and the site of the first Girl Scout headquarters. 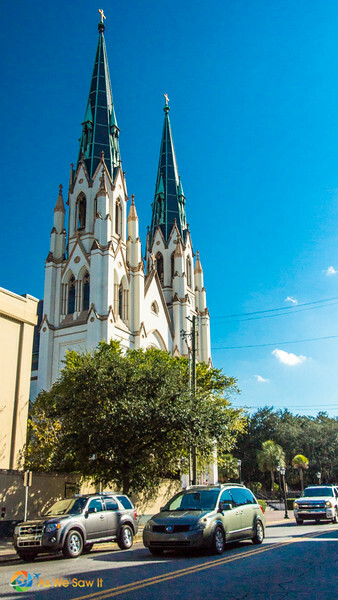 Cathedral of St. John the Baptist, which rivals the sky with its brilliant blue steeples. Its stained glass windows were made in Austria and its wood carvings of the stations of the cross came from Bavaria. 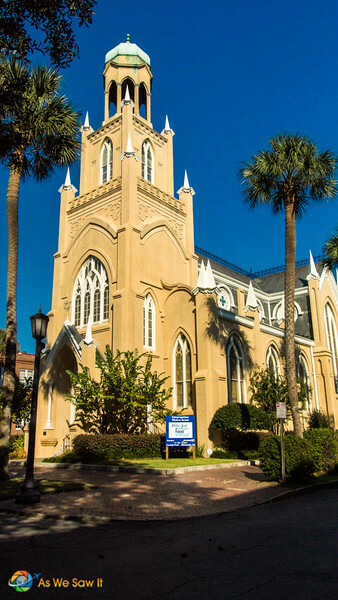 The congregation received a perpetual charter from Governor Telfair in 1790, which makes it the third-oldest congregation in the U.S. 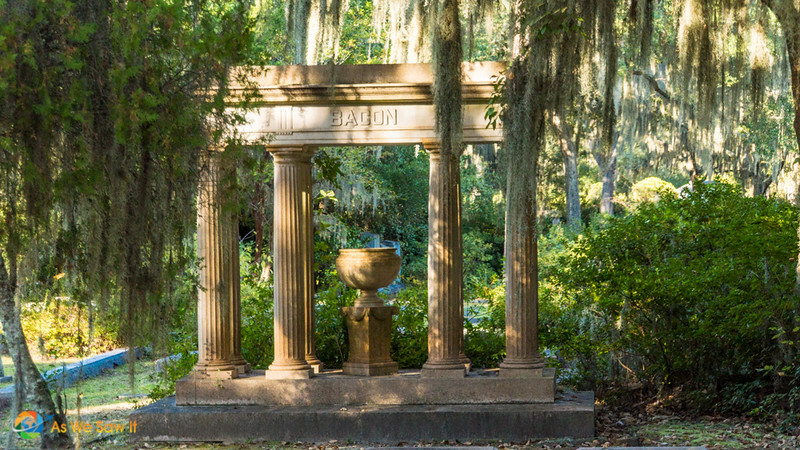 If you visit and have more than one day, consider spending a while in Forsyth Park, too. 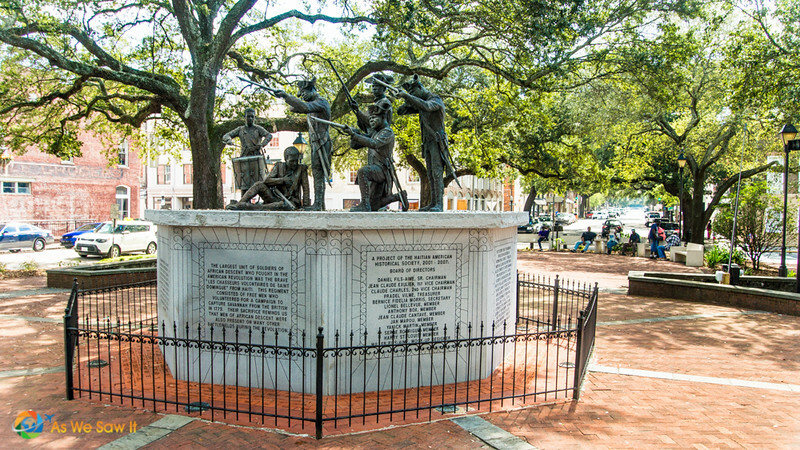 It is large enough to occupy the space that two of Savannah's squares should occupy. We rode past its dramatic fountain but unfortunately, Dan's photos didn't come out. Before we knew it our half hour ride was over and we were back at the Visitor Center. Time to get out and cross the street to our car. Back on the road we soon found our way to Bonaventure Cemetery. Not that we like hanging around dead bodies: We usually avoid the morbid and eerie. However, three locals had recommended it so highly we figured we should stop by to see why. Once we arrived we understood. We drove through its gates at 5 pm with the late afternoon sun slanting through the branches and Spanish moss overhead. Here and there the rays cast golden light onto grave markers, birds chirped and shadows grew long. It was quite peaceful, and not just because there were only two or three cars in the entire place. 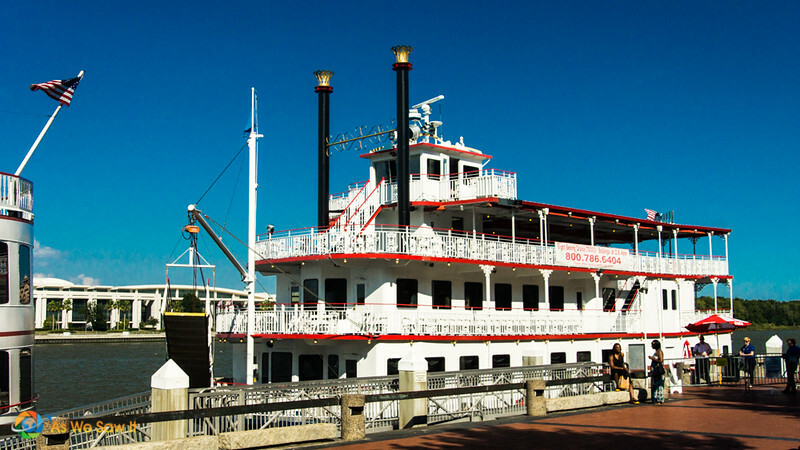 All we knew when we entered its gates was that it has a scenic bluff that overlooks the Wilmington River. We didn't know who were the famous people buried at Bonaventure Cemetery and we didn't care to look for their resting places anyway. We preferred to drive around aimlessly, which was a good thing since we didn't have a map, haha. It wasn't long before we arrived at the bluff, where we found a convenient spot to park. We climbed out and found some dramatic grave markers nearby. It would have served us right if we were locked in overnight. After all, we had entered at closing time and the cemetery hours were clearly posted on the gate. Still, a little time is better than none at all; it was certainly worth just the few minutes we were able to spend there. Most of our “one day” experiences include dinner and evening activities, but this time we had to cut our visit short. Time to head home to Florida. A shame that we had to, because Savannah is full of inviting places to enjoy an evening meal. I know we'll want to return. If you enjoyed this story, don’t miss the other half of our one day in Savannah saga. 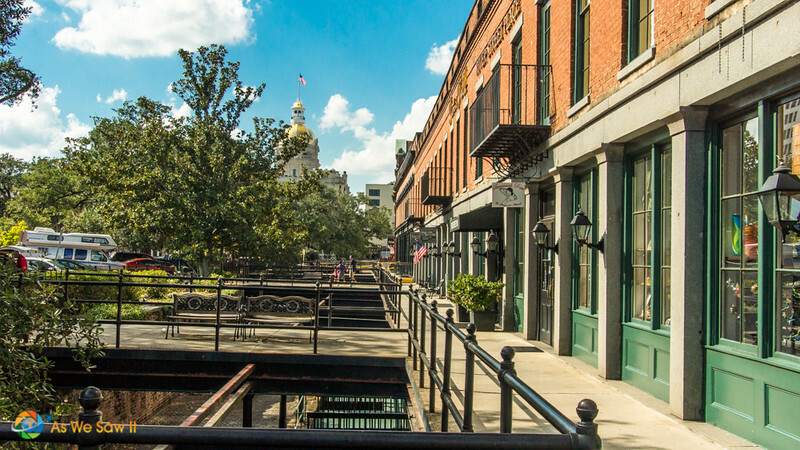 Read about the city's beautiful and unique squares and see some of the architecture that makes Savannah so special. Savannah is a gorgeous place! My favourite place to be! Savannah is quite an elegant old lady, isn’t she, Laura? Savannah is such a great town. Very walkable. Thanks for all the wonderful information on Savannah, I’ll be sure to re-read this article before my next visit 🙂 Fantastic photography too! Such an extensive and beautiful post. Savannah seems to be a lively city. So much to see and do! My husband and I like to explore places by walking or biking around, and this seems perfect for just that! Extensive is right, haha. I just couldn’t stop writing, which surprised me, considering that we were in the city for only a few hours. It sounds like you guys like to explore the way we do. Where have you been lately? Love your write-ups. So inspiring! The place looks like a photographer’s paradise and so easy to navigate and get around on foot. I love the picture of City Hall and how Cathedral of St. John the Baptist just pops out over the treelines!! 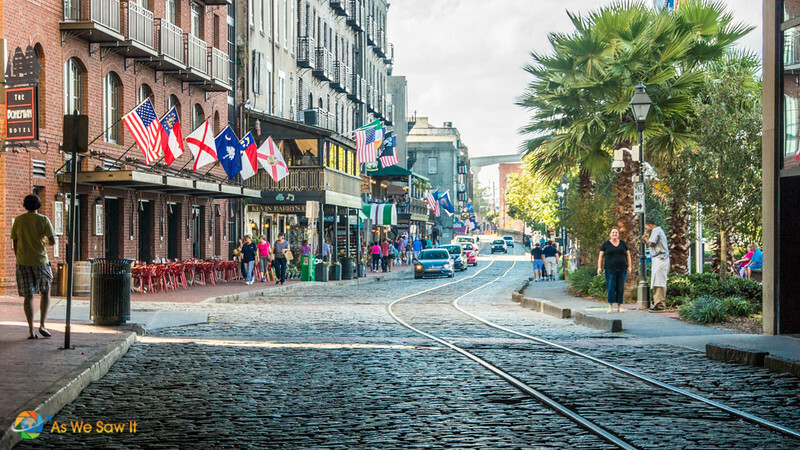 All in all, a great write-up – I hope I can visit Savannah someday and take in all the sights mentioned in your post! I hope you can, too, Constance. It’s a pretty place. Do you see a trip to the U.S. in the foreseeable future? Another pretty city! (I think I read about Charleston on your blog sometime back.) Savannah looks picture-perfect and so easy to walk around and enjoy doing ‘nothing’! Nope, we haven’t written about Charleston. This is the second half of a two-part story about Savannah though, so maybe you are thinking of last week’s post.